This blog will serve as the class website. I encourage postings, discussions and questions in regards to the curriculum, readings, and assignments for this class. 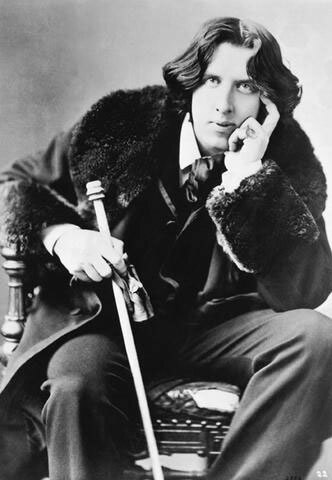 Our assignments this week will allow us to review the satire of Oscar Wilde, it's effectiveness in engaging the reader, and the relevancy of satire in today's world. TUESDAY, FEB. 12: As a closure activity, we will watch a clip from the movie "Paris, je T'aime" and compare the syntax and subject matter used in the movie to "The Importance of Being Earnest". We will also read a current satire that appeared in the Rochester City Newspaper, titled A City in Wales, and compare the two satiric pieces. THURSDAY, FEB. 14: For Valentine's Day, we will discuss T.S.Eliot's "The Love Song of J.Alfred Prufrock". A link to a full text of the poem can be found here. The poem is also in your text, Sound and Sense on pages 285-290. Please be prepared to discuss the poetic elements Eliot uses in the poem, including syntax and diction, irony, symbolism and the "objective correlative". A term introduced by T.S Eliot in his essay “Hamlet and His Problems” (1919). Eliot observes that there is something in Hamlet which Shakespeare cannot “drag into the light, contemplate, or manipulate into art”, at least not in the same way that he can with Othello’s jealousy, or Coriolanus’ pride. He goes on to deduce that “the only way of expressing emotion in the form or art is by finding an ‘objective correlative’; in other words, a set of objects, a situation, a chain of events which shall be the formula for that particular emotion; such that when the external facts, which must terminate in a sensory experience, are given, the emotion is immediately evoked.” (Selected Essays, [London: Faber and Faber, 1951], pp. 144-5). Over February break, you will be reading William Shakespeare's "Macbeth". I would like you to keep a reading response journal and write down your ideas as pertains to plot, character development and thematic elements such as conflict and power. Also, be thinking of how to apply the following quote to this text and to Shelley's "Frankenstein"
"Whoever fights with monsters should see to it that he does not become one himself"
Did anyone else think of the Hans Christian Anderson version of The Little Mermaid at the end of Eliot's poem? Seriously, I think there is a cool reversal here. Usually, the mermaid turns into sea foam when she is unable to attract and marry a human. Conversely, Prufrock’s rather dry romantic life makes him believe that the mermaids are mocking him. Or perhaps the mermaids are feminine entities of lust and lost opportunity...Either way I found the ending intriguing yet unexpected. Oh and my mom knows Weird Al! Also, I had a conversation with the lunch lady today. She told me that she doesn't have a Valentine and that I should feel sorry for her. (what do I say to that?) So naturally I asked her if she knows anything about Weird Al and she said yes! Nice interpretation, Vanessa. I like the idea of Prufrock turning inot foam at the end of the poem.Eliot is all about reversal, wrong-way turns, and maybe even a red herring or two...Do you think the lunch lady has anything incommon with Prufrock?